The ENGIE Fabricom and Iemants consortium chosen by Dong Energy to build the Walney 3 and 4 offshore substations, reports that Walney 3 set out today from the ENGIE Fabricom yard in Hoboken bound for the wind farm in the Irish Sea. Saturday morning at 6.30 a.m. various tugboats surrounded the barge. At 7.25 a.m., at high tide, the mooring lines were removed and the barge could sail away. With a height of 35 metres and weighing 2,900 tonnes, this is the second substation to leave the ENGIE Fabricom site this month. 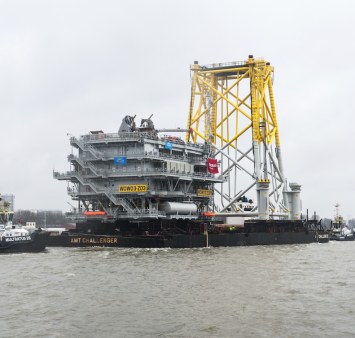 The substation was accompanied by its 48-metre-high jacket foundation that has been assembled on the Iemants site in Vlissingen in the Netherlands, the jacket was transported to Hoboken in the beginning of March. Earlier this month, the Race Bank 1 substation also left Belgium, and it will be followed by Walney 4 later in the month. The Walney wind farm in the Irish Sea, 19 km off the coast of Cumbria, already comprises two substations. Two additional substations will be added, making this the largest offshore wind farm in Europe. The wind farm will supply green power to 600,000 households in the UK, with the extension being commissioned in 2018.